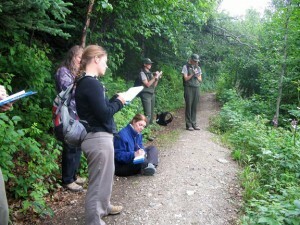 Students sketching along the nature trail during the “Walk with the Artist” event at the Wrangell-St. Elias National Park Visitor Information Center, Alaska. My first assignment as Artist-in-Residence for the Wrangell-St. Elias National Park last summer was to teach a workshop about sketching in the field. The sun blessed us as we ventured along the bluff trail overlooking the Copper River with views of the Wrangell Mountains. That evening I presented a slide show for guests at the Copper River Princess Wilderness Lodge. Volunteer workers at the remote airstrip, Jakes Bar, in the Wrangell-St. Elias National Park, Alaska. Left to right; myself, Barbara Tipton, and Janelle Eklund. My next adventure as Artist-in-Residence took me by small single engine aircraft to the park wilderness headquarters at May Creek where I joined a group of volunteers who cleared brush from two remote airstrips. 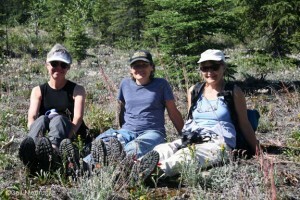 The three of us were part of a dozen or more who helped improve the historic gravel airstrips at Jakes Bar and Peavine. I plan to do paintings of each site with their beautiful rustic cabins. My next stop was Mc Carthy/Kennicott where I spent several gorgeous days. 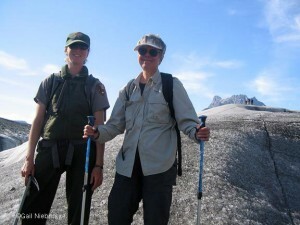 Park Ranger Marie accompanied me with a guide on an all day hike exploring the Root Glacier and the waterfall at Donahoe Peak in the Wrangell-St. Elias National Park. 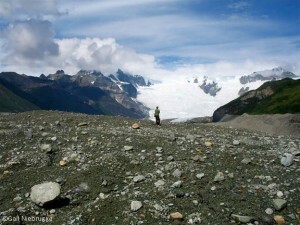 It was a hot, sunny day, ice crampons worked well in the porous surface of the glacial ice. 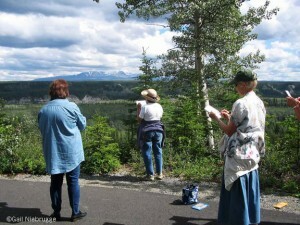 Students, including park Rangers, in my “Walk with the Artist” sketch class on the trail to Silk Stocking Row at the historic Kennicott. I gave two slide shows, one at the historic gym for visitors and locals, and another for the guests at the Kennicott Glacier Lodge. My park ranger guide looking at the Root Glacier Stairway Ice Falls. We hiked about 12 miles round trip this day, it was strenuous and extremely interesting. On the hike back to the Kennicott we had to wait for a black bear with two tiny spring cubs to leave the trail before we could continue. Just another day in the life of an artist.